Thank you, Maybe a dumb question but the 295/55/20 will fit my stock all terrain rim correct. and when you say 2” lift you mean just a 2” leveling kit in the front and nothing in rear would work also do you have any pictures of these mounted i would like to see how wide of a stance it is. Do you anticipate a lot of road noise? Time to get new tires on the all terrain love he look of the Nitto ridge grapplers. I have the stock all terrain 275/55r20 rims. When I go on Nitto.com it shows this size tire but when I enter in my truck it does not give me an option for that size. I also would like to know if I put a 2” leveling kit on front what is the largest tire I can get without rubbing. The dealership suggested getting Michelin LTX A2 but they do not look as aggressive as I would like. I do not want to go Full MT only AT. Yes all terrain but I get vibration at all speeds it gets worse in auto they keep testing in 2wd. I also have at 70 mph. So these pico results are within spec the service manager told me the truth was not supposed to be above 2g? That's when I pointed out to him that it is above 2g on the one line at 60 mph. Can someone help me make sense of this? The service manger does not know how to read it either do I. Pico picture attached. Lemon law lawyer has offered settlement from GM but that is based on them thinking the truck is within spec I was told it failed the pico then they sent this and said it didn't. By BBB you mean the better business bureau correct? Did you not try and go the lemon law route? So my service director is stating that they have hooked the vibration testing machine up to my truck. They stated that there are no spikes in the graph and that they do not see anything that gm would advise them to do work on. I am going to be taking a ride with the technician on Monday. I asked them to balance the rear drive shaft, they didn't do it. I told them about shimming the engine 3mm, I told them about the rear leaf springs and nothing. Getting frustrated! So the spinning on the rim issue you are referring to when I felt the rear of the truck hop or step out? I will check what tires it came with one way or another the issue with the vibration is getting fixed. I am going to get the clamps but first I want to give the dealership a chance to make it right. I have aftermarket Lund rock rails and side steps I am not even putting on until they fix it so they can't make excuses. First post on here. 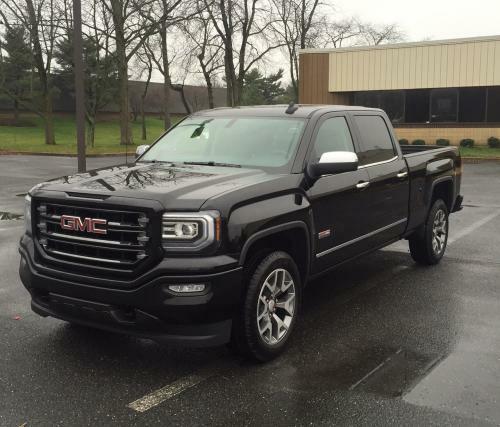 Just got a 2016 Sierra all terrain crew cab. There is a definite vibration in the steering wheel, I mainly notice it a low RPM 1200 or so in both v4 and v8 and in all 4x4 modes. I see all the posts and others having the problem. What is the solution who has actually had GMC dealership find and fix the issue? I am not a fan of waiting for things to get worse and gm to figure out what to do. Thanks for all your guys help and looking forward to being on the forum and showing pics of new truck an upgrades to come.